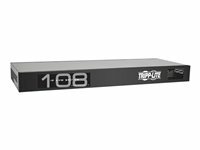 Tripp Lite NetCommander 8-Port Cat5 1U Rack-Mount 1+1 User Console KVM Switch with 19-in. 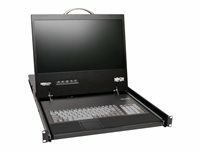 Tripp Lite NetCommander 16-Port Cat5 1U Rack-Mount 1+1 User Console KVM Switch with 19-in. Tripp Lite's B072-016-IP4 KVM Switch is the optimal solution for controlling up to 16 computers/servers locally, from across the room, down the street or around the globe on a network or the Internet. 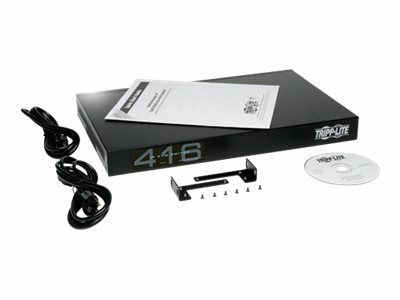 The B072-016-IP4 uses inexpensive, user-supplied Cat5e/6/6a cabling with Server Interface Units (sold separately) so you can connect computers/servers located up to 100 ft. away from the switch. This switch features dual Ethernet ports and dual power supplies; if one fails, the other takes over, keeping access uninterrupted. Switch easily between the 16 ports using an on-screen display (OSD), hotkey commands or a remote toolbar. Multi-level password protection prohibits unauthorized users from accessing connected computers, and a local user and up to four remote users can each log on and access different ports simultaneously. Virtual Media allows an.iso file to be mounted to a target server and accessed as if it were stored directly on it. Virtual Media data transfer rates up to 12Mbps are supported when using a B078-101-USB2 Server Interface Unit. Other features include RADIUS and LDAP/S authentication, system-sent SNMP messaging and an event log that tracks logins, reboots and network setting changes. Free NetCommander-AXS Management Software is available to access and control all of your Tripp Lite NetCommander IP KVM switches (B070 and B072 series). From a single interface, you can access server ports on any of your KVM switches, power cycle or power on/off outlets of IP PDUs and manage KVM settings. This software can be downloaded free of charge from the model support page for the B072-016-IP4. Directly connect up to 16 computers/servers. Connected computers/servers can be located up to 100 ft.(30 m.) away from the KVM using inexpensive Cat5e/6 cabling and B078-101-USB-1 SIUs. Supports up to 4 simultaneous remote sessions. In addition to multiple remote sessions, a local user can access the KVM simultaneously to the remote users. Java-based application allows for control of a target server via web browser from any location over a secure IP connection. Accessing the connected computers is a breeze; a wide range of video and mouse sync settings ensure optimal remote session performance in any situation. Supports the highest security standards for encryption(128-bit AES and HTTPS). BIOS level control to any server’s brand and model, regardless of the server condition and network connectivity. Covers the entire spectrum of crash scenarios. PDU Control – Allows you to add IP PDU’s as devices that can be controlled by the KVM. Individual ports on the KVM can be assigned to a port on a PDU, allowing you to Power Cycle or Power Off/On the computer/server connected to that port without leaving the KVM session screen. Multi-Level account access – Administrator and User accounts can be created, with a password being required to access the KVM switch and your assigned permissions. Administrator accounts have full access, while User accounts can be set up to access only the ports and features necessary to that individual. Dual Ethernet Ports – If one network port fails, the other takes over. 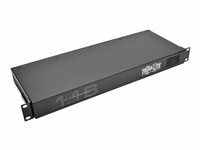 Dual Power Supplies – If one power supply fails, the other takes over. Dual Serial Ports – Connect serial manageable devices, such as PDUs, firewalls, and routers. Allows for system sent messages to SNMP server to notify of LAN or power failures. Event log records events that take place on the installation, such as logins, reboots, network settings changes, etc.. Allows for the installation of a SSL certificate to ensure secure transactions between the Web servers and browsers. Access and control the KVM via the graphical remote interface, or a text based local OSD. Flash upgradeable firmware over the network.